The BARF diet for dogs has it’s pros and cons. But, exactly what is a BARF diet? And is this the type of diet you should be feeding your dog? The foods that we feed our dogs is very important, much in a similar manner to how the food we feed ourselves is paramount to our overall health and wellness. Since our dogs are given the exact same meal on a daily basis for the entirety of their lifetimes, it is crucial that we be confident in the nutritious value and safety of their food. Due to the increased awareness of health problems caused by filler ingredients and preservatives in commercial dog foods, the recent influx of canine food allergies, as well as alarming recall rates, many pet owners have turned towards alternative homemade diets, such as the BARF diet for dogs (also known as the biologically appropriate raw food diet, or the bones and raw food diet) with great success. What are the origins of the BARF dog diet? The BARF diet was developed by Dr. Ian Billinghurst, an Australian veterinary surgeon, who realized that poor nutrition from commercially available dog foods was possibly attributing to the maladies he observed in his and his clients’ pets. These common problems included skin allergies, obesity, and joint pain. After eliminating commercial food from the diet of his own pets and instead feeding raw meat and bones (more similar to what dog’s ancestors have eaten), he saw dramatic improvements in their health and well-being. What foods can my dog eat on the BARF diet? The BARF diet is composed of 60 – 80% raw meaty bones, which are defined as bones that contain approximately 50% meat. The rest of the diet contains fruit, vegetables, eggs, dairy, and offal. Common ingredients in a BARF diet include chicken neck, chicken wings, chicken back, beef ribs, raw egg, yogurt, lamb riblets, organ meats, leafy greens, and blueberries, among others. Why do the foods have to be raw? Proponents of the BARF diet believe that cooking meat or other foods will destroy the nutritional value of the ingredients. When food is cooked, the cell wall is damaged, which can also render vitamins, minerals, and enzymes unavailable for digestion. 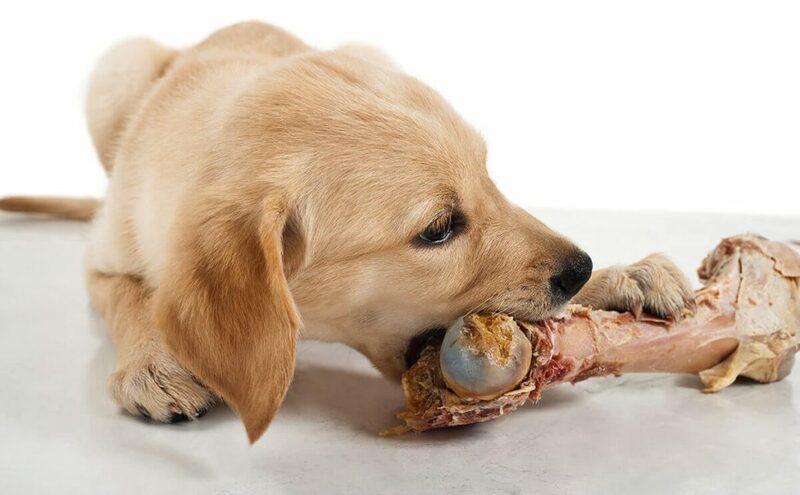 Bones should always be fed raw because cooked bones may splinter when eaten, causing serious problems in the digestive system such as perforated intestines or obstructions. Additionally, raw foods are considered to be more natural to what dogs’ ancestors would have eaten. Since canines have not evolved to have weak jaws and flat teeth for chewing a plant-based diet, the argument stands that a meat-heavy omnivorous diet is more appropriate for their biology. In many ways, BARF is akin to paleo for humans. What are the benefits of raw dog food? Proponents of the raw food diet for dogs claim that the lack of grains, preservatives, and fillers commonly found in commercially processed foods leads to better all-around health. Testimonials from BARF-feeding pet owners claim that skin conditions cleared, energy levels increased, chronic illnesses disappeared, and joint issues, such as arthritis, were greatly improved. Grains, fillers, and preservatives have all been suggested to cause inflammation in a dog’s body which can weaken the immune and exacerbate existing conditions, including arthritis and allergies. Therefore, the elimination of these ingredients has been thought to “reset” the dog’s body and restore it to its natural state. Can puppies eat BARF food? The BARF diet for puppies is slightly different than it is for adult dogs, given the differences in their metabolism, digestive system, tooth development, and nutritional needs. They should have limited offal, in comparison to adult dogs, and their calcium and phosphorous levels should be monitored, as insufficient amounts of these minerals can lead to osteodystrophy. Where can I buy BARF dog food? A butcher shop or local farmer is the best source of raw meats for your pet. You can often buy the meats in bulk at a discounted price and store the excess in the freezer. Since dogs eat the meaty bones and organ meats that are typically discarded, pet owners often receive these cuts at a cheaper price. Some companies also produce BARF patties or nuggets, which are frozen portions that are pre-made into appropriate compositions for your pet. Freeze-dried versions are also available, which eliminate the mess and potential health hazards associated with handling raw food. These latter two varieties also take the guess work out of determining which meats, bones, and supplementary ingredients provide the most balanced diet. Is the BARF diet for dogs more nutritious? When discussing pet nutrition, it is important to keep in mind that “natural” does not always mean better. An improperly executed BARF diet could easily lead to pancreatitis if too much fat is given, as well as nutritional imbalances if the meals are too rich in protein. One advantage of a high quality dry food is that meals are consistently and appropriately portioned, which eliminates much of the guesswork. What are the disadvantages of the BARF diet? The BARF diet has been linked to increased risk of dental fracture, intestinal perforation, intestinal blockages, and infectious diarrhea in dogs. This diet is also more expensive than most dry and wet foods, and poses a health risk to humans. While dogs are generally immune to bacteria found in raw foods, feeding your dog raw meat could potentially introduce salmonella or e.coli into your system, especially when you pick up your dog’s droppings after a meal. What should I know when making homemade dog food? When you opt to make your own dog food as part of the BARF diet you should be aware that your pet’s balanced nutritional needs may not be met. While feeding dogs raw meat may be biologically appropriate, the question of surviving vs. thriving is often brought up. Besides raw meat, other important ingredients including vitamins, minerals, probiotics, prebiotics, digestive enzymes, and supplements are necessary, and are often recommended in order to ensure the dog’s digestive system can properly handle the new diet. If you opt to make your dog’s food at home, as opposed to purchasing pre-made BARF nuggets or patties, you should first consult with a veterinarian or BARF diet professional.